This model contains one 215 square foot flame retardant filter that cleans to .5 micron and a filter protection shield protecting the filter from exposure to hot sparks. This extends the life of the filter. This filter is cleaned by compressed air. The contents of an air tank in the machine are released instantly into the filter and pulse the dust off of the filters which falls into the drawer below. This cleaning procedure is activated by a switch which pulses the filter. 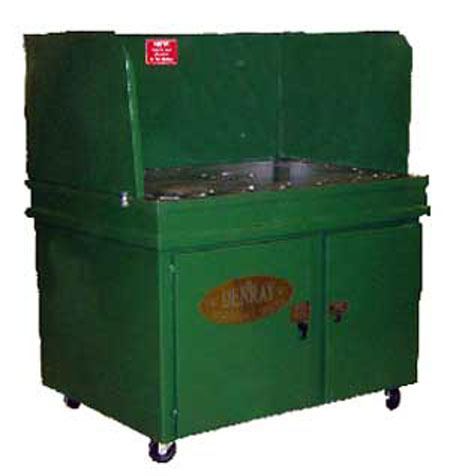 * Comes standard with water pan that helps prevent hot sparks from entering filter area. * Spun bonded filters may be washed with hot water to deep clean and extend filter life.